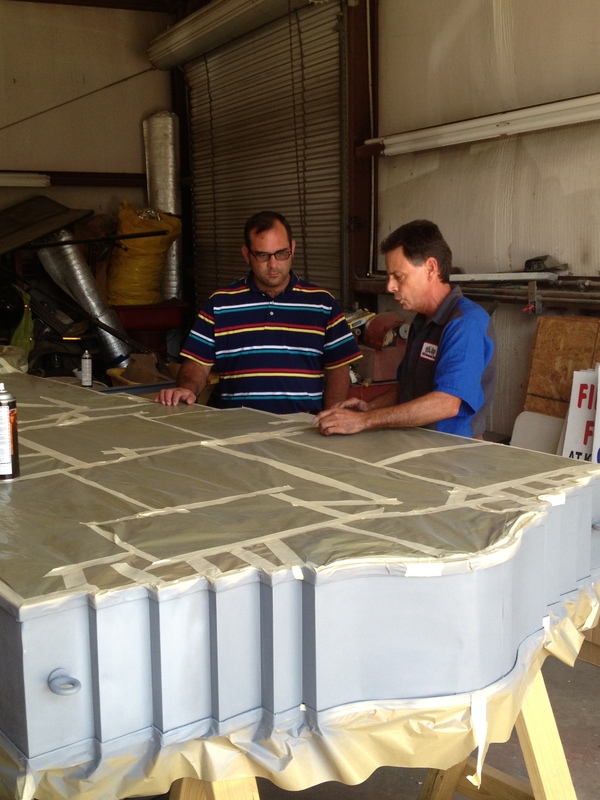 Photo Caption: Chamber Special Events and Preservation Coordinator Adam Holland and Ken Mobley discuss status of progress on WCNB Clock restoration at Ken’s Kustoms Body Shop in Oak Grove. The Chamber hopes to transport the clock to Carter Signs in Bastrop, La. in the coming weeks to finish its restoration. OAK GROVE — Many have noticed the void that has been left at the corner of Briggs and Main since mid-May when one of Oak Grove’s most treasured icons came down from her perch, but that void will be gone soon as progress continues on the restoration of the West Carroll National Bank Clock that hung high on its corner perch for most of the 20th Century. Originally the goal was to have the clock finished and back on its perch by the July 4th Holiday, however once the project actually began, it was soon realized that the clock’s finish was done with porcelain which required much study , research and consultation with professionals around the country to insure what was being done was correct. Ken’s Kustoms of Oak Grove are in the final stages of restoring the physical integrity of the clock along with restoring its finish and soon it will be transported to Carter Signs in Bastrop, La. where the all of the neon and mechanical motors which keep the time will be completely replaced. Carter Signs will then bring her home and return it to its perch where she will proudly return to her roll as the official time keeper for the town of Oak Grove. Funding for the restoration has been made possible by the Chamber’s Festival Fund. This entry was posted in Uncategorized and tagged Chamber, Clock, Downtown, Fiske Theatre, Historic, Oak Grove, WCNB, West Carroll Chamber. Bookmark the permalink.